This effect is explained by this youtuber here. And, while this usually goes unnoticed unless you are blurring a picture of the flag of Portugal, I wonder how to do a less unrealistic lens blur using Gimp. The stress is on the words "less unrealistic" because the subject seems to be quite complex, but at least a quadratic average of the RGB values seems to give better results in the examples shown on the YouTube video referenced above. I am using GIMP 2.8.18 which is somewhat outdated. AFAIK there is no "photo blur" in Gimp itself (there is a "Focus blur" plugin). Even in editors that do not have color correct filter facilities its possible to do the following. 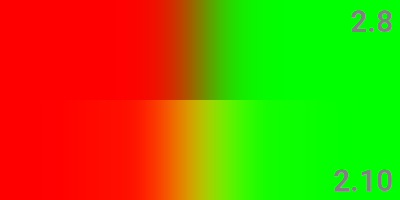 Un-gamma correct by inverting picture and applying gamma (note there is a likelihood this wont work since many software use a small linear portion in the color slope instead of doing gamma for the full range), then invert again. Or use a cheap trick and apply 1/your gamma. Not the answer you're looking for? Browse other questions tagged gimp blur or ask your own question. How can I create the illusion of movement with GIMP? How to bisect a selection with GIMP?